The iron ore price pulled back once again on Thursday as worsening demand fundamentals further clouded the outlook for a market already overwhelmed by a supply glut. The 62% Fe benchmark import price including freight and insurance at the port of Tianjin tracked by The SteelIndex fell $0.40 or just under 0.6% to $62.30 a tonne on Thursday. Weak sentiment particularly on markets in top consumer China has seen the price decline 5.8% just this week. So far in 2015 the price has fallen 14.3% following a year in which the commodity nearly halved in value. Iron ore is trading at the lowest levels since early May 2009. Iron ore hit a peak above $190 a tonne in February 2011. China, which consumers some 70% of the seaborne iron ore trade of 1.3 billion tonnes per annum and forges almost as much steel as the rest of the world combined, plans to cut its growth target to around 7% in 2015, its lowest goal in 11 years. Reuters quotes Bart Jaworski, analyst at Davy Research, as saying weakness will extend "into the Chinese New Year and probably a bit of a lift afterwards. 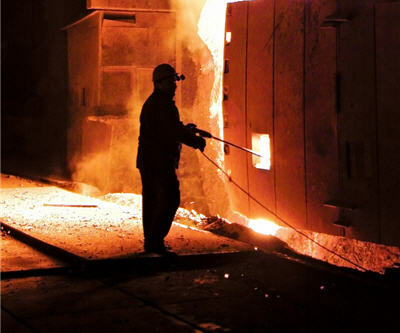 The Chinese steel mills and iron-ore traders we just surveyed are looking to restock a bit". However the firm's survey found a "resounding bearishness" for iron-ore prices over the next 12 months. Steel demand in China has been hurt by problems in the property sector and Beijing's attempt to move the economy away from reliance on fixed investment to one driven by consumption. Steel consumption fell 3.4% in 2014 – the first time in 14 years that demand was weaker reports the WSJ. Chinese steel prices have already dropped 12% since the start of the year. That compares to a 14% retreat in all of 2014. In a note released earlier this week Caroline Bain of Capital Economics argued "a further increase in global iron ore supply this year and only subdued demand growth suggests iron ore prices will continue to drift lower." The independent research house expects prices to end 2015 at around $60 per tonne with risks to the downside. Capital Economics is not alone in forecasting further weakness in the iron ore price. Goldman Sachs released its estimates for iron ore on Friday. The investment bank cut its outlook for iron ore for this year to $66 a tonne this year, down substantially from an earlier estimate of $80. Capital Economics is not even the most bearish forecaster – Citigroup believes iron ore will average $58 in 2015; another nearly 10% drop from the today's ruling price.